TALENTED acts from Renfrewshire and beyond are getting the chance to appear on the bill at this year’s Spree festival. The annual event – on in Paisley this October – will see the return of the Danny Kyle Open Stage made famous by Glasgow’s Celtic Connections event. The stage – named after the Paisley-born folk legend – will be broadcast live on Celtic Music Radio each night, and aims to provide a platform for the best unsigned musical talent. 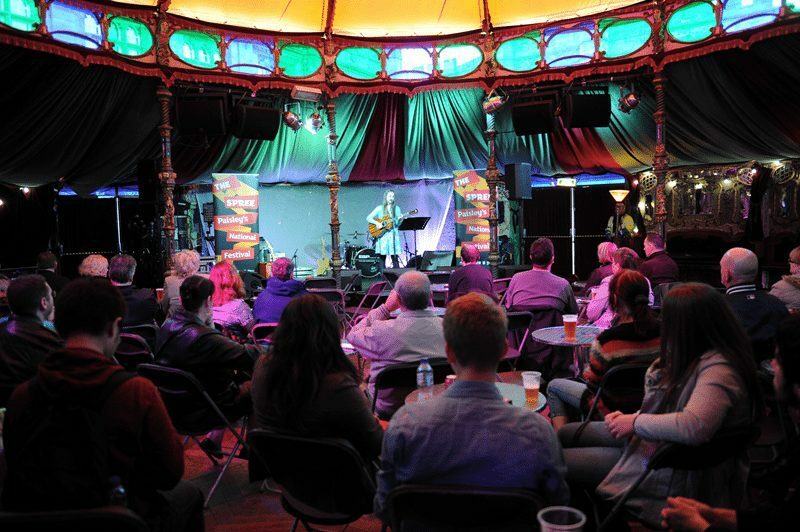 It will take place every weekday of the festival in the specially-erected Spiegeltent in County Square at 5pm each night, and will be free to enter. The best acts from the week will be invited back to attend the final-night showcase on Friday 16 October. The top prize for the winner is a full day (eight hours) recording at Paisley’s Brick Lane studios, while two other acts will be selected to receive a session on Celtic Music Radio. Last year’s Danny Kyle Open Stage saw four winners – local band Lemonhaze, Martha L Healy, David Nicol and Katee Kross. The event’s organiser and presenter Liz Clark said: “The Danny Kyle Open Stage has been a great platform to launch many an artist over the last 16 years, with over 3,000 applications and 1,400 acts having appeared on the stage. The Spree festival is run by Renfrewshire Council as part of the push towards the area’s bid for UK City of Culture 2021. The musical centrepiece of this year’s festival is a sold-out show in Paisley Abbey with Scottish rockers Idlewild alongside the Royal Scottish National Orchestra. Other musical acts set to feature include James Grant, Karen Matheson, Aidan Moffat, James Yorkston, Karine Polwart, Barbara Dickson, Horse McDonald and Scottish Album of the Year 2015 winner Kathryn Joseph. There will also be two Best of Scottish Comedy shows in association with The Stand Comedy Club and a full programme of children’s events for the October week. Renfrewshire Council Leader Mark Macmillan added: “We are delighted to welcome the Danny Kyle Open Stage back to Paisley for another Spree.